Malaysia Canon PIXMA PRO-100 Color Inkjet Printer (Printing Only- Wired & Wireless- 8-ink dye-based system) malaysia Supplier Office Supplies Company KL Kuala Lumpur Klang Valley Selangor . Vibrant glossy photo prints that last up to 200 years under proper storage condition. The PIXMA Pro-100 supports Wi-Fi and Ethernet connection. 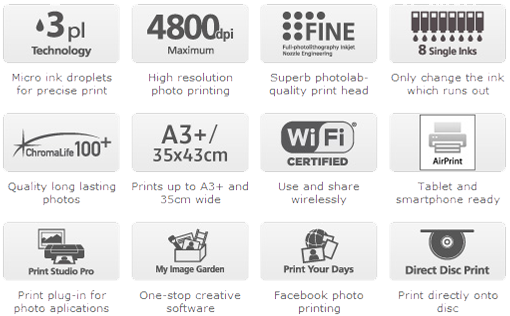 AirPrint™ is also supported for iOS devices. Rear paper input tray and manual feed slot for 14 x 17” and thick paper. Colour PT-101: Approx. 1min. 30secs. Black and White PT-101: Approx. 2mins. 55secs. Color PP-201: Approx. 1min. 30sec. Black and White PP-201: Approx. 2mins. 55secs. Color SG-201: Approx. 1min. 30secs. Black and White SG-201: Approx. 2mins. 55secs. Color LU-101: Approx. 1min. 30secs. Black and White LU-101: Approx. 2mins. 55secs. Colour / PT-101 / Borderless: Approx. 34secs. Photo Paper Plus Semi-gloss (SG-201): A3+, A3, A4, 8 x 10"